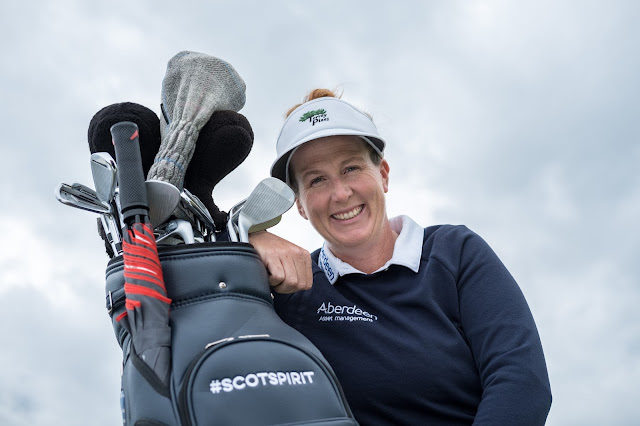 American born Golf Professional and adopted Scot, Beth Allen, has literally been carrying #scotspirit around the world with her this year as she took to the fairways for her rookie season on the LPGA Tour. The 35 year old native Californian, fell in love with Scotland, the Home of Golf, when she joined the Ladies European Tour in 2008. Now based in Edinburgh, Beth’s passion for her adopted country is reflected perfectly in VisitScotland’s global campaign which highlights how different people from across the country embody the ‘Spirit of Scotland’. When Beth is not playing on tour or practicing at North Berwick West Golf Club she can be found exploring her beloved Leith or grabbing a coffee in Stockbridge. She is also fond of making the trip to Glasgow and exploring the bars and restaurants or playing some of the west coast links courses like Prestwick. This week Beth returns to the fairways of Scotland when she tees off in the Aberdeen Asset Management Ladies Scottish Open at Dundonald Links from the 27th until 30th July (www.ladiesscottishopen.com). Ahead of the tournament, Beth will also be a guest speaker at the Ladies Scottish Open Women’s Leadership Forum taking place today, Tuesday 25th July at the course. 2017 is an exciting year for women’s golf in Scotland with the newly co-sanctioned Aberdeen Asset Management Ladies Scottish Open being staged at the same venues as the Men’s Scottish Open. Next week will see The Ricoh Women’s British Open being hosted for the first time at Kingsbarns Links near St Andrews. Both events underline Scotland’s commitment to growing the women’s game as we look towards hosting The 2019 Solheim Cup at Gleneagles. The Spirit of Scotland campaign was launched in February 2016 and been used more than an impressive 430,000 times. It is built on extensive research which shows that people think Scotland has a unique spirit– whether it’s the magic of the landscapes or the warmth of the people. Beth carries the #scotspirit logo on the front of her bag giving it significant exposure, reaching a global audience who regularly tune in to watch the LPGA on the Golf Channel in North America.